Lee is a bona fide cinematic genius, and his lively and inventive take on tired material proves that thriller corn needn't be mindless in its machinations. 128 min. Universal Pictures. Director: Spike Lee. 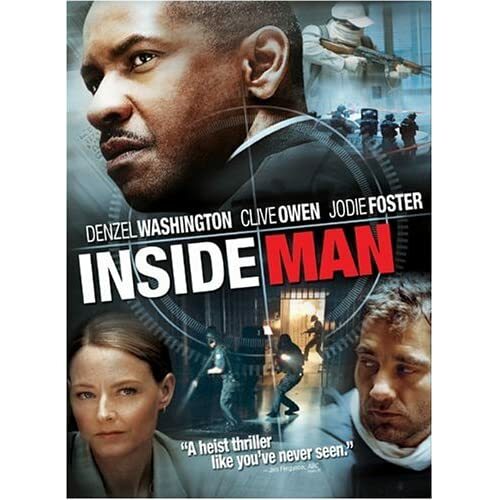 Cast: Denzel Washington, Clive Owen, Jodie Foster, Christopher Plummer, Willem Dafoe. In taking up a year of director Spike Lee's time, Inside Man has an upside and a downside. On the one hand, Lee rehabilitates the Hollywood thriller with flavorful real-world intrusions, and on the other, the genre shortens Lee's leash a bit. Both responses are valid, but the result is the same: a good time at the movies that also happens to be the least interesting film on Lee's resume. Lee's old pal Denzel Washington takes the lead as Detective Keith Frazier, a New York cop facing an internal investigation on an embezzlement rap. Despite his ambiguous standing, Frazier and his partner (Chiwetel Ejiofor) get handed a hot one: a hostage crisis at the Manhattan Trust Bank. There, Dalton Russell (Clive Owen) and his team of break-in artists execute an elaborate plan. First-time screenwriter Russell Gewirtz spins a clever everyone's-a-suspect mystery: is one of the hostages an inside man, woman, or child? And just what is Russell after? Complicating matters for Frazier is Manhattan Trust's chairman of the board, Arthur Case (Christopher Plummer). A man with something to hide (in a secret safe-deposit box), Case hires power broker Madeline White (Jodie Foster) to move and shake her way into the middle of the crisis, the better to protect Case's secret. The material would be no more convincing than it sounds in the hands of a mediocre filmmaker, and not much better in the hands of a good one. But Spike Lee is a bona fide cinematic genius, and his lively and inventive take on tired material proves that thriller corn needn't be mindless in its machinations. As he did in 25th Hour, Lee brings a catalog of post-9/11 New York archetypes to the party. An act of terror in a bustling bank bristles blacks, whites, Sikhs, Latinos, and Jews in equal measure. The cops on the scene (including Willem Dafoe) can hardly hold in their own prejudices, and Lee playfully frames the film with two versions of A.R. Rahman and Gulzar's hit Bollywood song "Chaiyya Chaiyya" (chalk up another marvelous score from Terence Blanchard, as well). This is Lee's New York, from the Cyclone roller coaster to the marble and wood-panelled halls of Wall Street power to the cramped apartment of Frazier and his hot-to-trot wife. The fun is in the unrestrained narrative structure and the telling cultural details, like Lee's depiction of a wired populace hooked on cell phones, iPods, and video games (racist ones that celebrate crime, no less). It's a city where innocents wind up treated as criminals and the guilty pull strings to stay in power. The truth behind the topsy-turvy heist is hogwash, but happily capitalizes on a widespread desire to see the powerful sweat a little. Lee's having fun here, and who can blame him as he taps into '70s flair (the script name-drops Dog Day Afternoon and Serpico, among other films) while playing cops and robbers. If anyone can breathe life into the moribund hostage drama, Lee is the (inside) man. 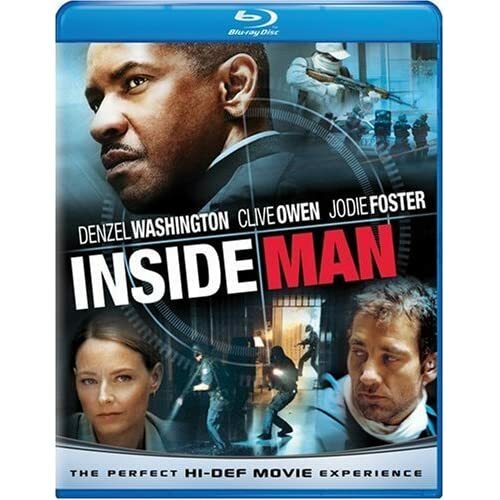 Inside Man looks spectacular in its Blu-Ray debut. High-def agrees with Lee, who always uses visual storytelling to maximum effect. As usual, Universal delivers a near-flawless A/V presentation that crisply recreates the theatrical experience at its ideal level of sharpness and presentational competence. Deep blacks, eye-popping color, and considerable texture are the hallmarks of this detailed, inviting image, and the audio is similarly top-notch in its power, subtlety and attention to detail. Though clarity is job one, carried out brilliantly, the immersion of the surround effects is awesome. All previous bonus features have been ported over to the Blu-ray, beginning with a feature commentary with director Spike Lee. Always a fascinating commentator on his own films, Lee once more doesn't disappoint, covering all aspects of production and his thoughtfully prepared approach to capturing the film in his head. Next up are five "Deleted Scenes" (19:38, SD). "The Making of Inside Man" (10:20, SD) is a standard behind-the-scenes featurette, though it includes glimpses of the first cast read-through, a rehearsal, and the scoring session. Interviewees include Lee, producer Brian Grazer, Denzel Washington, Clive Owen, and Jodie Foster. The best and most heart-warming feature is "Number Four" (10:08, SD), an all-too-short chat between Lee and Washington. In friendly, bantering fashion, they discuss their four collaborations to date (soon to be five with an Inside Man sequel). Anecdotes spill out happily, and the two discuss their directing careers as well as Washington's acting and specifics of the four films they have in common. Lastly, Universal includes its signature My Scenes feature and BD-Live access. Run, don't walk to add this disc to your Blu-ray collection. All site content © 2000-2019 Peter Canavese. Page generated at 04/18/2019 02:53:52AM.